The apparatus has been already described in the post DIY Alpha Spectrometer. 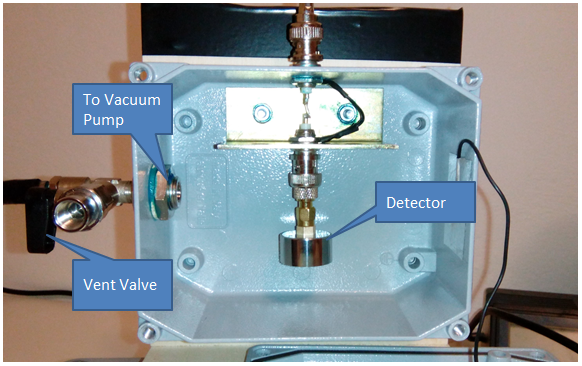 The picture below shows the measuring chamber with the alpha detector and the connection to the vacuum pump. There is also an electronic part (not shown in the picture) for the amplification and processing of the signal produced by the sensor. For alpha particle measurements the detector efficiency is practically 100%, so parameter ε = 1. Parameter fα is the fraction of the alpha decays of the process being examined. The shape factor takes into account the fraction of alpha particles that can be intercepted by the surface of the sensor, in practice determines the solid angle underlying the sensor: Ω / 4π. This isotope of polonium is an alpha emitter with a half-life of 138.39 days. One milligram of this metalloid emits the same number of alpha particles of 5 grams of the radio. The decay of this element also releases a large amount of energy: half a gram of polonium-210, if it is thermally isolated from the environment, it can quickly reach temperatures of about 500 ° C, and develop about 140 W / g into thermal energy. A few curies (GBq) of polonium-210 emits a blue luminescence due to excitation of the surrounding air for Compton effect. 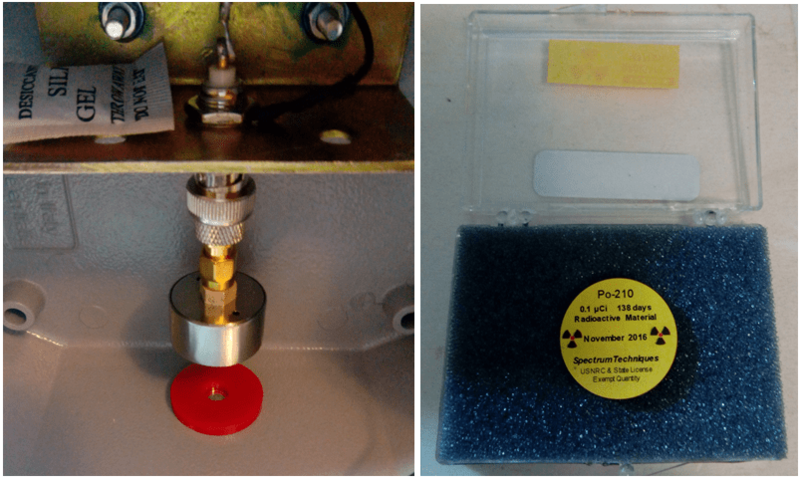 Infinitesimal quantity of this isotope can be used as alpha source sample for energy calibration in the alpha spectrometer. It should be handled with great care since the source is open and this isotope is highly toxic. 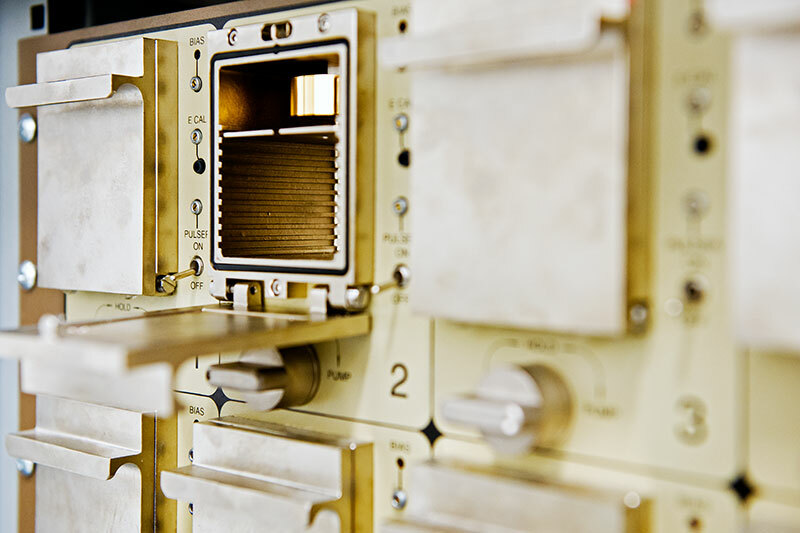 In the images below shows the source and its location inside the instrument. For this measure, the efficiency of the detector, calculated according to the formula described above, is 72.4. For Polonium 210, the factor f is 1 because all polonium atoms decay alpha at the same energy. The images below show the measurement results. With the data at our disposal we can then calculate the expected activity, obtaining a value of 1327 Bq, very close to the measured data. Americium-241 was directly obtained from plutonium upon absorption of one neutron. It decays by emission of a α-particle to 237Np; the half-life of this decay was first determined as 510 ± 20 years but then corrected to 432.2 years. Americium is the only synthetic element to have found its way into the household, where one common type of smoke detector uses 241Am in the form of americium dioxide as its source of ionizing radiation. This isotope is preferred over 226Ra because it emits 5 times more alpha particles and relatively little harmful gamma radiation. The amount of americium in a typical new smoke detector is 1 microcurie (1 µCi, 37 KBq) or 0.28 microgram. This amount declines slowly as the americium decays into neptunium-237, a different transuranic element with a much longer half-life (about 2.14 million years). With its half-life of 432.2 years, the americium in a smoke detector includes about 3% neptunium after 19 years, and about 5% after 32 years. Americium decays by means of the 4n + 1 chain of Np-237 is commonly called the “neptunium series” or “neptunium cascade”. The americium decay takes place by means of emission of alpha particles with energy of 5443 KeV and 5486 KeV. 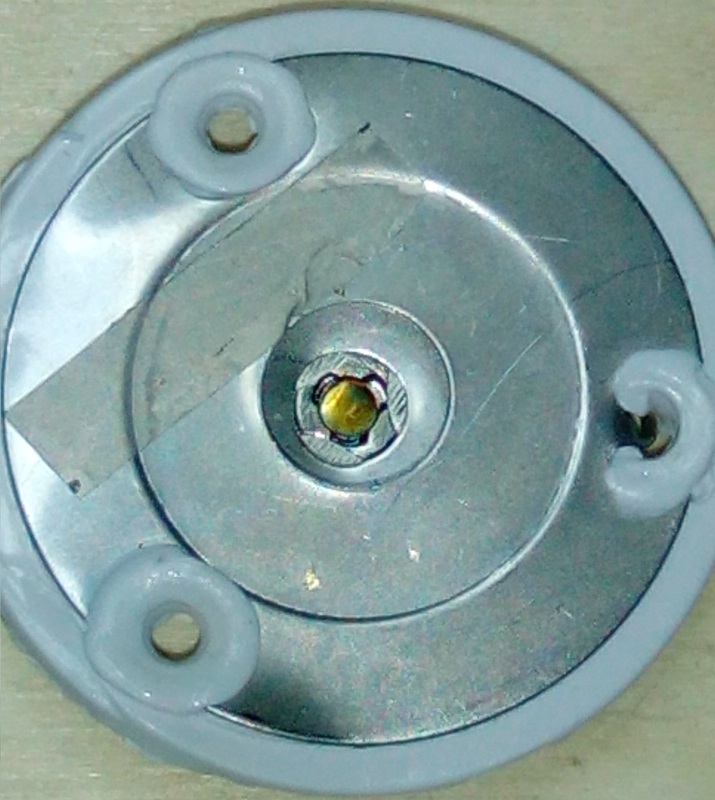 For our test we used a americium capsule contained in a smoke detector. Keep in mind that the active element is deposited on a support protected by a very thin golden plate, as seen in the image above, this has the effect of lowering a bit the energy of alpha particles and enlarge the line emission decreasing the resolution. For this measure, the efficiency of the detector, calculated according to the formula described above, is 50.3. For americium 241, the factor f is 1 because all atoms of americium decay alpha with close energies, all included in the ROI. The images below show the measurement results. The measurement provides a value of 18431 Bq, which corresponds to 0.5 μCi. The theoretical activity of the source should be 0.9 μCi and the decay time of the americium is 432 years, so the activity has remained almost unchanged. It should be noted that the source, for security, is screened by a thin layer of gold that could slightly reduce the activity of the source. Strontium-90 is a radioactive isotope of strontium produced by nuclear fission, with a half-life of 28.8 years. It undergoes β−decay into yttrium-90, with a decay energy of 0.546 MeV. Strontium-90 has applications in medicine and industry and is an isotope of concern in fallout from nuclear weapons and nuclear accidents. Naturally occurring strontium is nonradioactive and nontoxic at levels normally found in the environment, but 90Sr is a radiation hazard. 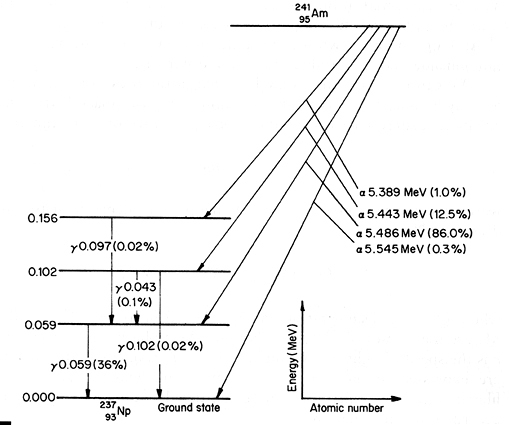 90Sr undergoes β− decay with a half-life of 28.79 years and a decay energy of 0.546 MeV distributed to an electron, an anti-neutrino, and the yttrium isotope 90Y, which in turn undergoes β− decay with half-life of 64 hours and decay energy 2.28 MeV distributed to an electron, an anti-neutrino, and 90Zr (zirconium), which is stable. Note that 90Sr/Y is almost a pure beta particle source; the gamma photon emission from the decay of 90Y is so infrequent that it can normally be ignored. 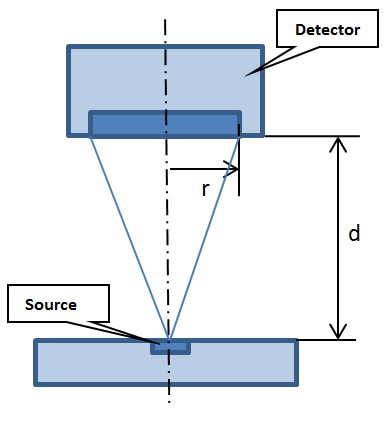 The alpha spectrometer can also be used for the measurements of beta particles, even if the electrons are more penetrating, and then the stopping power of the detector is lower; this means that the more energetic electrons can pass through the sensitive layer of the detector releasing only a part of their energy. Below, the spectrum obtained from a sample source to 0,1 μCi. In this case, the efficiency of the detector has been altered so as to obtain a value close to the expected value. The problem with beta particles is that the less energy particles are stopped by the material that covers the source and can not reach the detector. This is evident in the spectrum in which you see how energies are less than 200 KeV. Taking these factors into account, however, it is still possible to carry out measurements of activities also of beta sources.